“Nature can be wild and unpredictable, and whilst I was able to withstand winter snow and summer heat exposed to the elements 60 metres up the Observer Tree, it is the sensible and safe decision to climb down now rather than put lives at risk with the bushfire so close,” Ms Gibson said. Footage and stills are available on request. Miranda will be available for comment in the near future. Posted on March 7, 2013, in Media Releases. Bookmark the permalink. 26 Comments. Miranda is an outstanding human being; a credit to her gender and to humanity. Well done Miranda, a stirling effort but fire is unpredictable. You have made a real impact with your record tree sit and have given Ta Ann customers something to think about. Welcome back to Earth. Congratulations Miranda for all that you’ve done to protect the forests. You are a hero. Welcome back to earth, Miranda. You made the best decision. We will continue to stand with you in protecting the forests. 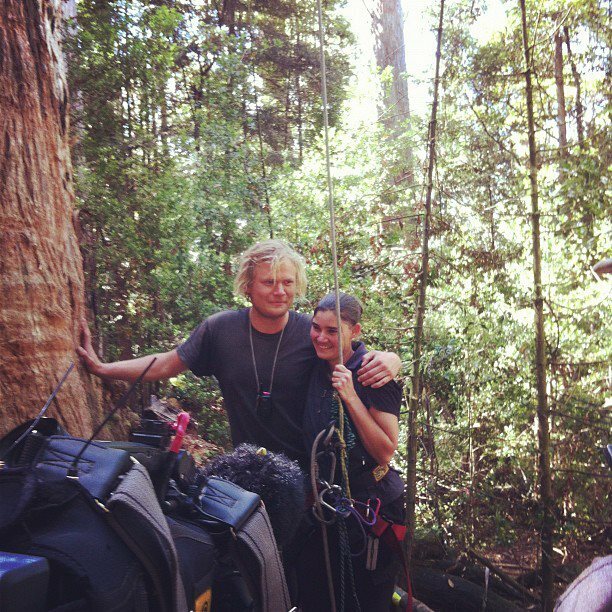 You are truly an amazing lady, courageous, strong and determined, and to be admired by everyone who loves this planet and the forests of not only Tasmania, but the world, you have done your best, and should be very proud of your achievements, I wish you all the best now you have landed on the ground again. love and thoughts to a true lover of nature, thank you. Madeleine Kennedy. Miranda you have brought the eyes, minds and hearts of the world into our magnificent forests. Thank you from the bottom of my heart for your tenacious and gracious presence over the past 15 months. Take time to regain your earth-legs after so many days swaying in the treetop. I truly hope you will be able to return to embrace your tree and that it stays safe from the fires. A celebratory picnic maybe when WHA is declared! Thanks Miranda for your courage, commitment and gentle beauty, glad you are safe and hope your re-entry is easy. Well done Miranda. A true stalwart in the fight for our magnificent forests. Your amazing – although emotional your safety is paramount. Thank you for all you have done. Be proud. You are a legend Miranda. You should be immensely proud of yourself, Miranda. You are an inspiration. I am glad that you are out of potential harm’s way. I hope your transition to life ‘on the ground’ goes smoothly. What a heart wrenching decision for you to have to make Miranda. All of us who have joined you in spirit for the last 457 days watched in awe as you seemed to become one with that beautiful creation of nature. It is to be hoped that it will still stand after the fire passes as a symbol for all the forests that are in danger all over our planet. Well done, you have kept people talking inspired school children and maybe just maybe touched the conscience of the people who have the power to put a stop to the madness. Stay safe. Miranda, I could not have done what you have done nor lasted. It was wise to put life first. Good decision. You live to fight another day and you have many ahead of you and so many loyal friends. Those who desperately resort to crime like what they also did at Camp Flozza, have a life in a corner like a trapped dog, possibly with nowhere esle to turn but to their Stihl, substance abuse and welfare. Their violence is not a cause but a sad clinging to Taswegian lumberjacking for lumberjacking sake. Reflect on history of the 1980s Franklin Protest and see how deep Bob Brown was in a culture of rednecks. See how far his stance has now come. You have stamped an irreversible chapter of forest protest in Tasmania’s interminable forest struggle, which in many ways sets a standard across the planet. ObserverTree is just one chapter. It could have more. As creative author your shape the next story of hope. Please have a break and take family time out to regain your health and spirit. Personally, what I have admired has been the constant messages of support from your family. They are special. It is their support that has amazed me. I’m glad to read you’re safe! Yet to find out what’s happening there. We are living climate change for sure! The devastating effects of deforestation and mining world wide! It has to be a priority to now save ALL forests and keep them standing, they can do a major job in stabilizing climate and COOLING the Earth. Our voices will not be silenced! Arson (in other words the companies intentionally created the blazes). I’m also wondering if it’s arson.